Capacitors for C.V.T. & U.P.S. For use in CVT/ UPS where high harmonic contents occurred on the basic 50 Hz frequency. Manufactuerd with high reliability low loss mettalised polypropylene film. 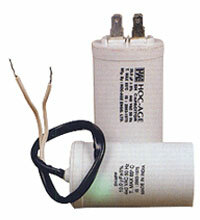 Typical voltage and capacitance range are 400 to 600V and 2 to 60 mfd respectively.